Published monthly since 1986, the Marina Times provides “hyper-local” news coverage of important trends and developments that impact the quality of life in San Francisco’s affluent northern neighborhoods which include the Marina, Cow Hollow, Pacific Heights*, Russian Hill, Nob Hill and North Beach. Regular coverage includes: local news and information, profiles of community leaders, calendar of events, arts and entertainment, restaurant reviews, food and wine, business and finance, health and fitness, shopping tips, technology reviews, weekend getaways, home and garden, real estate, family, and pets. Marina Times readers are active and influential stakeholders who shop locally. 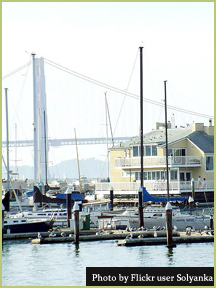 They read the Marina Times to stay informed and to assist them with their dining, entertainment, and purchasing decisions. They are affluent home owners (62%) with disposable income (Median Household Income is $159,019), well educated (82% College degree or higher), and Professional/Managerial (78%). Distribution by Neighborhood: 10,000 copies are hand-delivered, door-to-door to homes, condos, apartments and businesses located in San Francisco’s affluent Marina and Cow Hollow neighborhoods; an additional 10,000 copies are distributed through sidewalk pedestals and retail locations throughout San Francisco’s Northern neighborhoods, including the Marina, Cow Hollow, Upper Fillmore Street, Russian Hill, Upper Polk Street, North Beach, Fisherman’s Wharf, the Embarcadero, Union Square and SOMA.